-A group of people sharing aspects of language, culture and/or ethnicity. -A historically constituted, stable community of people, formed on the basis of a common language, territory, economic life, and psychological make-up manifested in a common culture. 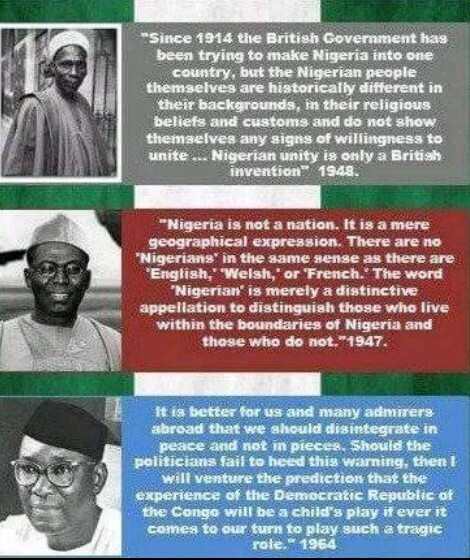 From the above definition, it doesn't define the Nation "Nigeria". The people who call themselves Nigerians don't share anything in common;they have different value system, different psychological make-up, different food, different culture and different language without common territory. Before the invasion of Africa by the British colonialists, Nigeria never existed. What we have was independent kingdoms, The Bornu empire, the Oduduwa kingdom,the Bini kingdom,the Biafra kingdom. These nations existed independently until the conquest began, the colonial masters forcefully amalgamated these kingdoms and destroyed their Sovereignties without taking cognisance of the cultural differences that exist between them. The intention of Britain was to exploit the resources from the region rather than building a people. This is the main reason why the entity called Nigeria has refused to grow after 100 years ,it has continued to deteriorate, from the very day it got independence from the British colonial masters, the country has been under different conflicts. The 1967/70 civil war which erupted just seven (7) years after independence is a proof that the Nation Nigeria will never thrive, but out of greed and economic interest, the British government of Harold Wilson was more interested in the resources (crude oil) in the Biafra region and they committed the greatest genocide of human history all in the guise of maintaining the unity of their colony. More than 3 million people lost their lives, the quest to maintain the nonexistent unity in the country was only to subjugate a group of certain people. A country where you cannot freely live your life because of fear of been killed for not belonging to a particular religion/­ethnicity, jobs and appointments are based on one's ethnicity. In short, the country is characterised with injustice, nepotism,tribalism, religious bigotry and hatred. Zambia, Zimbabwe, Malawi were once under one country, India and Pakistan, Singapore and Malaysia; southern Sudan/Northern Sudan and many others. Though many fought brutal civil wars to dissolve the union, Nigeria has already fought a war and no country will survive two civil wars. The renewed agitation of self determination by the indigenous people of Biafra is a quest that it's time is due. Biafra is older than Nigeria and wants to go back to who they were before the amalgamation that created Nigeria emerged. Those who pretend to be Nigerians and keep boasting that the unity of Nigeria is non -negotiable are liars and compromised fellows who are scared of facing the present realities of life. The current president Mr. Buhari has been ill advised by these demented fellows to continue to cling to an already expired country Nigeria. His dictatorships has made him to turn the Biafran territories to war a zone through his deployment of soldiers and other security agents while his Boko-Haram brothers are receiving protection from the government. Nigeria is living on borrowed time and it's time nature prevails. There was no Nigeria or Nigerians before the 1914 amalgamation, the time is ripe for the dissolution of Nigeria to give rise to the freedom of the original people of the land. Whoever that opposes peaceful revolution will make violent revolution inevitable. The world is put under prior notice, the only solution is total freedom and any attempt to trigger war will be the beginning of another world war, they should be ready to receive more refugees from Africa...its time to dissolve Nigeria, better late than never!